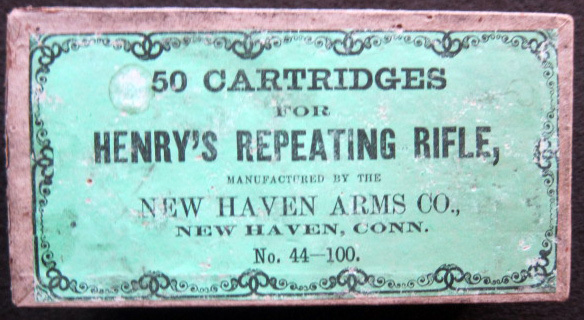 44 Henry Rimfire Cartridges - Manufactured by New Haven Arms Co.
A highly desirable box of early 44 Henry rimfire cartridges. These early boxes manufactured by the New Haven Arms Co. are sought after accouterments to accompany a Henry Rifle. 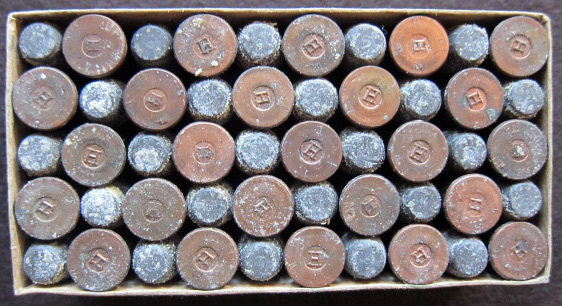 Therefore, this box of ammunition was made and sold in the same era as the Henry Rifles, circa 1863 – 1865. This is the rare “Tall 4’s” box making it the rarest of the three variations. The box is in excellent overall condition showing one small water stain on the top label (about a ¼” in diameter). In addition, some slight soiling from age and handling. Most noteworthy, the top label is 100% intact and the box is solid with no split seams. Although, the box has been opened it contains all the original .44 flat, raised “H” head stamped bullets in a dished circle. Consequently, the cartridges are very good and in original uncleaned condition. Furthermore, the cartridges appear to have never been removed from the box. Now covered in plastic wrap for protection.